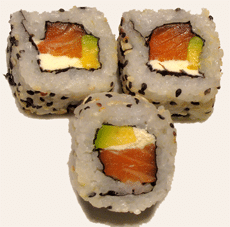 This will make two Philadelphia rolls, which will make your day if you are a big fan of salmon and cream cheese! Arrange your selected items across the middle section of the rice, the “traditional (for lack of a better word) items are the cream cheese and the salmon. Start folding up the roll, keeping a careful eye in the ingredients, and as you work your way up to the top, tighten the roll by pressing down on your mat forming a somewhat square shape.